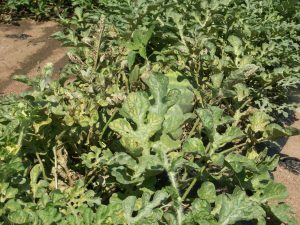 We have received a number of reports of outbreaks of spider mites, primarily in watermelons in the field and cucumbers in high tunnels. 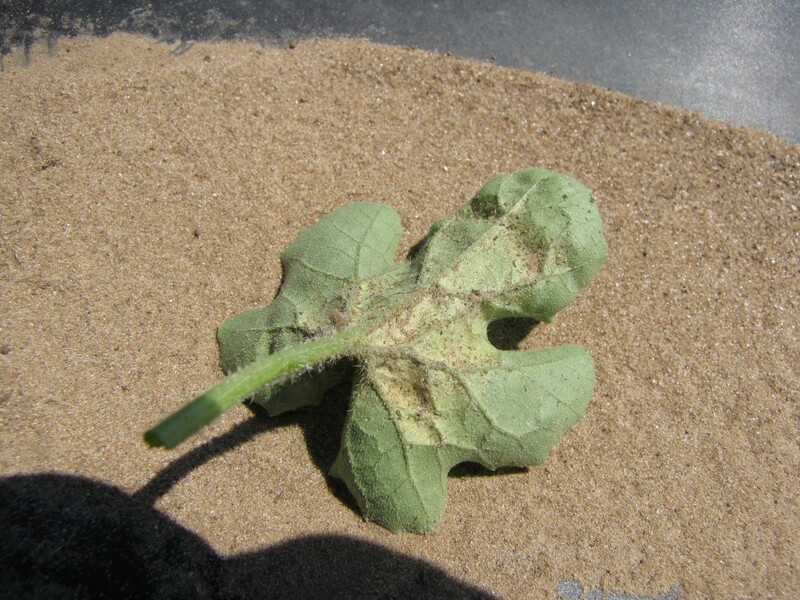 Spider mite damage can be recognized by the chlorosis often observed on older leaves (Figure 1). Plus, the underside of leaves affected by spider mites often appears ‘dirty’ due to the debris caught by the webbing (Figure 2). The problems in high tunnels are not unexpected because one of the primary causes of mortality in mite populations is rainfall washing them off the plants and, of course, that is lacking completely in high tunnels. In addition, the warmer temperatures present in high tunnels allow mites to complete generations faster so populations can build to high levels quickly. The hot weather recently is helping to drive population increases in fields as well. In both scenarios, we don’t really have treatment thresholds for mites. Generally speaking, if populations are increasing, they need to be controlled. Once the decision to treat has been made, that’s where things get very different. 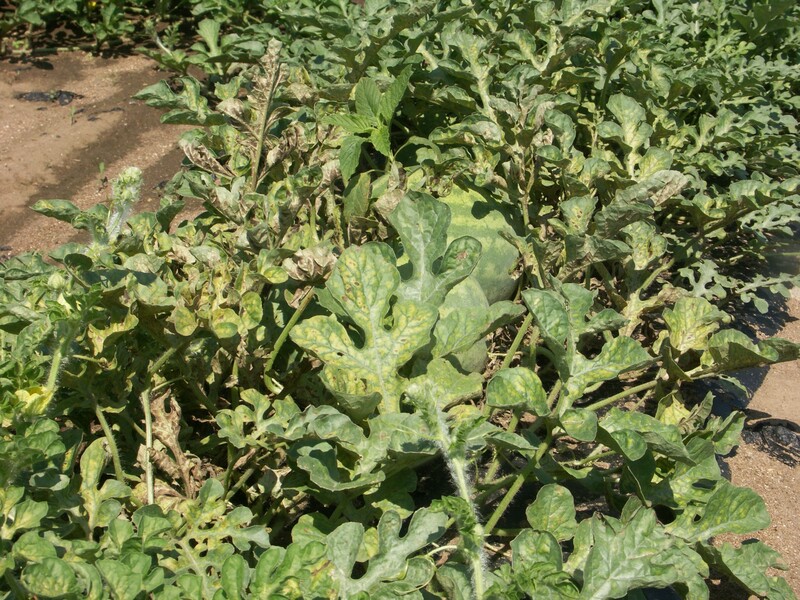 In watermelons, we have a variety of pesticide choices. See page 117 of the Midwest Vegetable Production Guide (ID56) for the list of options. Most of these miticides will provide good to excellent control of spider mites. In high tunnels, the choice of a pesticide is a little more complicated. First, you need to find the products available for use on your crop. If, for example, tomatoes is the crop of concern, you can find 6 options to choose from on page 137 of the ID56, Acramite®, Agri-Mek®, Nelata®, Oberon®, Portal®, and wettable sulfur. However, since you are growing in a high tunnel (defined as a greenhouse by the Office of the Indiana State Chemist), some of those options are not available to you, namely Nealta® and Portal®. So, you need to choose from the other three options. Sulfur is much less effective than the other two choices and is primarily for organic growers. If you are a conventional grower, your choices would come down to Acramite®, Agri-Mek® and Oberon®, either of which will work well. If you have trouble accessing this page because of a disability, please contact Vegetable Crops Hotline at guan40@purdue.edu.